CumbiaSazo is a cumbia dance party that celebrates music, visual arts & culture and donates to different community causes each event. 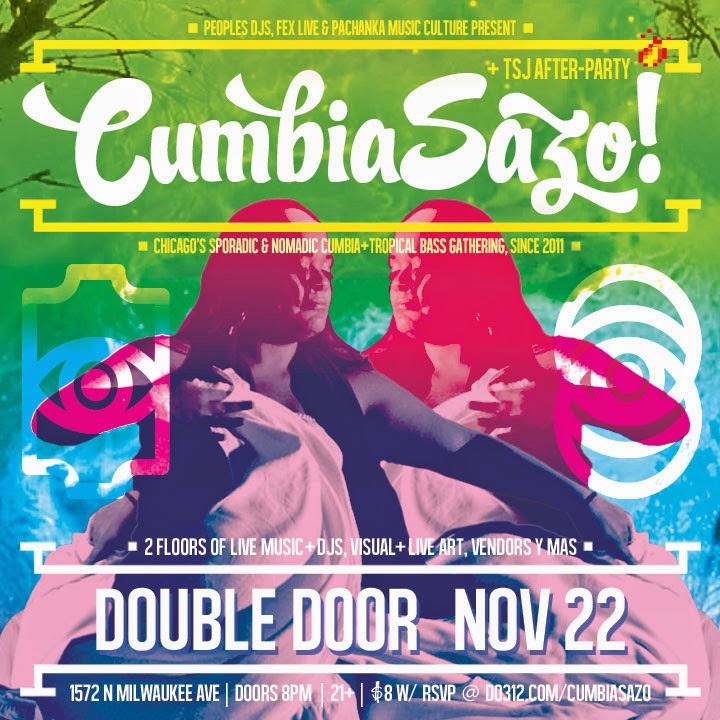 On November 22, CumbiaSazo teams with Teachers for Social Justice to throw an after-party for the TSJ curriculum fair at Wicker Park's amazing Double Door, where Bomba Con Buya and Texas' DJ Chorizo Funk will perform in addition to over 10 local DJs on 2 floors for a full night of dance & de-stress. The party also will have food, a live arts stage, and a visual arts market featuring over 20 artists/vendors where you can no doubt find something to enjoy or perhaps gifts for the holiday season. The CumbiaSazo crew has long-been involved in throwing the after-party for TSJ and we couldn't be more excited to both donate to TSJ and facilitate some dance floor liberation. Be on the lookout for a “teachers lounge” room at the party (lower level) with TSJ merch and a social justice art gallery! $8 entry w/ RSVP at do312.com/cumbiasazo or by mentioning 'TSJ' at the door. Otherwise it's $15 cover the day of. For more info and the full music & arts market lineup, visit www.cumbiasazo.com. When you pre-register you'll be able to enter right away and avoid the lines. You'll also be supplying us with valuable information that will help us plan for your individual needs at the fair. 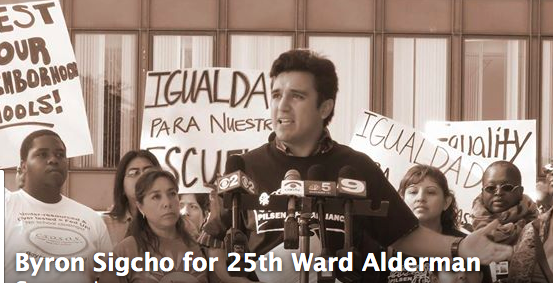 Teachers for Social Justice supports Byron Sigcho for city council in the 25th ward. TSJ Meeting: Nov 8, Help Plan the Curriculum Fair! Come to the LAST MEETING before the TSJ Curriculum Fair (which will be Nov 22) and help plan/build for the 13th Teaching for Social Justice Curriculum Fair!! Help make this CF be the biggest and most powerful ever, with workshops, curriculum exhibits, resource tables, keynote presentations, food, TSJ t-shirts, books for sale, culture, camaraderie, hundreds of like-minded people, and more!!! We will break into committees and work-there is plenty to do, and you do not need to have already been involved-Anyone can attend and chip in! And DON'T Forget to ADVANCE REGISTER! It will help us all! This is our moment! The power of grassroots organizing and a revitalized Chicago Teachers Union has put education justice on the front burner in Chicago. There is broad-based disgust with the dictates of mayor 1% and the corporate and financial elites who are remaking the city in their interests while working class people and people of color are struggling and pushed to the margins. Every great social movement produces its leaders—women and men, teachers, workers, students, parents who rise to the moment and become the spokespeople, visionaries, and courageous champions of struggles for justice against all odds. Karen Jennings Lewis, teacher and a founder of the Caucus of Rank and File Educators, rose up to lead the Chicago Teachers Union as a social movement union, to dare to challenge Mayor Rahm Emanuel in the historic 2012 Chicago teachers strike, and was poised to contend with some of the most powerful economic and political forces in the U.S. for the mayor of Chicago. Karen has lead the fight against education privatization and Chicago’s racist apartheid education system. 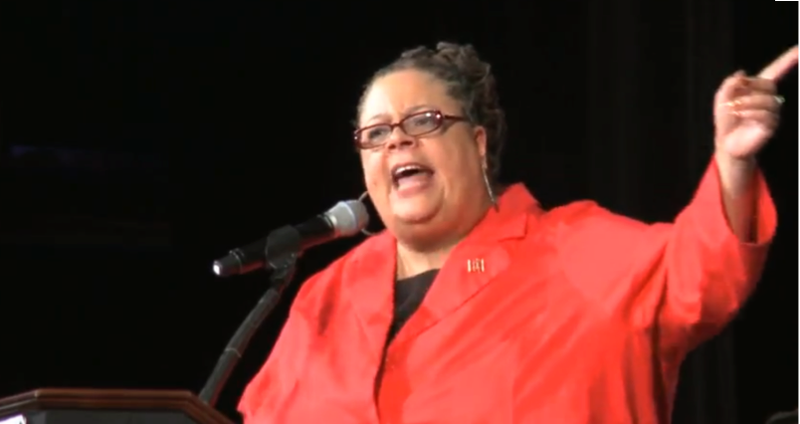 Even more, Karen Lewis has stepped to the forefront of a growing movement for justice in our schools, our communities, and our workplaces. Karen has been an unwavering friend of TSJ since we began working together in 2008. Karen, we are with you in heart and sprit as you battle to regain your health. With humility, we pledge to redouble our efforts to win an elected representative school board for Chicago as a strategic step to increase democracy. This is something we can all unite around. And we pledge to continue to work together with parents, teachers, students, unions, and community members to fight for the schools and the city we deserve. Karen, we love you! Keep fighting! Sorry, the deadline has passed to exhibit curriculum, have a resource table or present a workshop. Thanks for your interest, but time has run out to apply to exhibit curriculum, have a resource table, or present a workshop. Plan to apply for the 2015 Curriculum Fair. We're leaving the rest of this post up here for folks who want to plan for the 2015 Curriculum Fair. E-mail us at tsjfair14@gmail.com for more info! Do you want to exhibit your curriculum at the TSJ CF? What does it mean to "exhibit" curriculum at the CF? Do you want to present a workshop? Click here to apply. What's the difference between an "exhibit" and a "resource table?" Help us promote the TSJ Curriculum Fair with these fantastic flyers! TSJ thanks Ellen Gradman @sparkyourart for donating her design services to create this amazing poster! Download, print, copy, and distribute everywhere! Black and white version here! Register now to attend the 13th Annual TSJ Curriculum Fair! TSJ Curriculum Fair Registration-NOW OPEN! If you're interested in presenting a workshop, exhibiting curriculum or displaying resources click here. If you want to get involved in planning and volunteering at the CF come to our Sept. 27 meeting... for more info click here. Calling Educators and Organizations for TSJ Curriculum Fair 2014! The deadline to apply for the 2014 CF has passed... please plan to apply for the 2015 CF. TSJ Curriculum Fair 2014 Is Back! Each teacher/exhibitor gets a table at the Fair to set up her/his materials. Many teachers exhibit curriculum by bringing a tri-fold board (like those science fair boards) and bring lesson or unit plans, student work, assignments, artifacts, video, whatever, to share their curriculum ideas. Many bring their students along who sit at the table and explain the work with their teachers. The CF is set up so that we can browse the "exhibits," talk with each other, and share lessons. Although the main focus of the CF is person-to-person contact through the exhibitors at their tables, we also have a limited number of workshops. 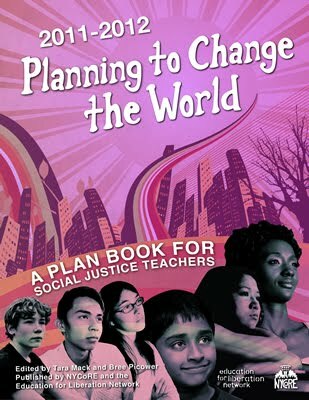 These range from curricular innovations about social justice pedagogy to, for example, using multicultural children's literature to organizing for educational justice. These provide more in-depth, interactive ways for teachers and students to share what they've been learning and doing in their classrooms, and for activists/organizers to create dialogue and spaces for learning and for all of us to bring democracy to education and Chicago. These are our schools! Exhibitors are usually teachers who have taught a lesson, unit, or project, or who have some developed ideas to teach. We really encourage classroom teachers who are doing this work. Resource tables are usually for organizations that produce curriculum and resources for teachers and want to share them w/ others. 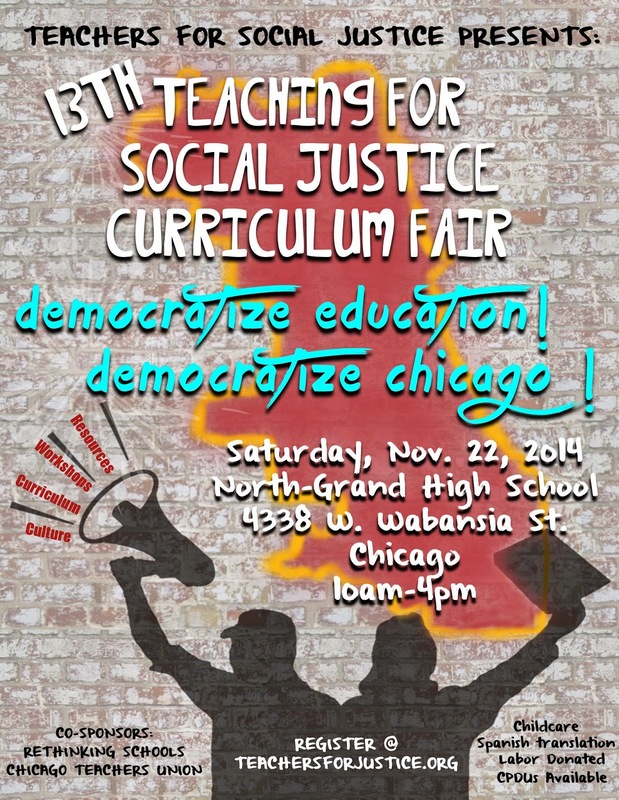 Get involved in creating the 13th annual Teaching for Social Justice Curriculum Fair! 1. 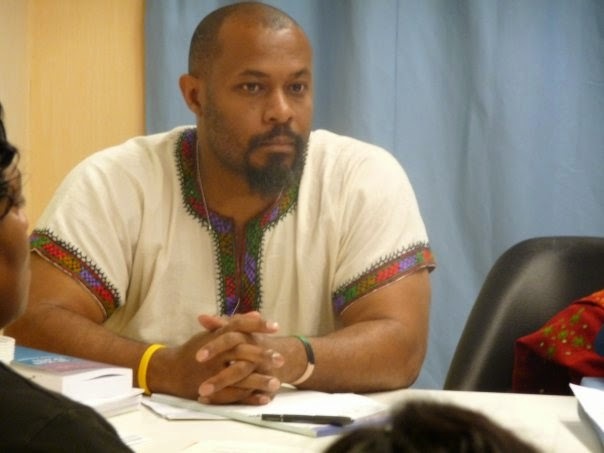 Discussion: Democratize Education, Democratize Chicago! WE NEED VOLUNTEERS! Below is a list of committees-can you help? Every year, the CF is put on by over 100 volunteers, and you can be one of them! People help out the day of the CF, and many help out before. Right now we are recruiting people to help on the following committees (full committee descriptions and contact info here). Each committee will be holding its own committee meetings, so contact them now to get involved! To volunteer for any committee, click here! UWM & City of Milwaukee: End Charter Enrollment Bribes! Please sign this petition from the Milwaukee Teacher Education Association to end the practice of paying parents and community members to enroll or refer students to privately run charter schools in Wisconsin! It has come to light this week that several Wisconsin privately-run charter schools have been using $100, $200, and gift cards to bribe parents and community members to refer and enroll children. The schools even specify that to receive a payment, the child referred must be present on Sept. 19. Attendance on this date determines the level of state funding that each school receives. This bribery scheme to increase enrollment spits in the face of schools that are working hard to increase enrollment the old fashioned way, by providing a quality education. If you think schools shouldn't be able to artificially inflate enrollment through bribes then please sign this petition. Please share this petition widely! 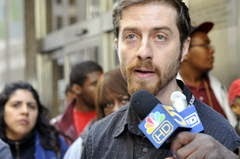 NYC High Schools Refuse to Give Test - Support these courageous teachers! On Thursday, May 1, 2014, we, the teachers and school staff, at the International High School at Prospect Heights are refusing to give the NYC English Language Arts Performance Assessment Exam. We are standing in solidarity with the more than 50% of our parents who have opted their students out of taking the test. Please support the teachers and staff members who have joined together to abstain from administering a test we believe is harmful to English Language Learners(ELLS). We are not willing to sacrifice the trust of our students, their feelings of self worth, and our professional duty to do what is best for them. In good conscience, as educators dedicated to the learning of our students and the welfare of our school communities, we are not administering this test. We ask that Chancellor Carmen Fariña remove the New York ELA Performance Exam in favor of an assessment created by educators who best know the individual needs of their students and classrooms. HOW CAN YOU SUPPORT THIS MOVEMENT? Change your profile pic on FB to our logo below!